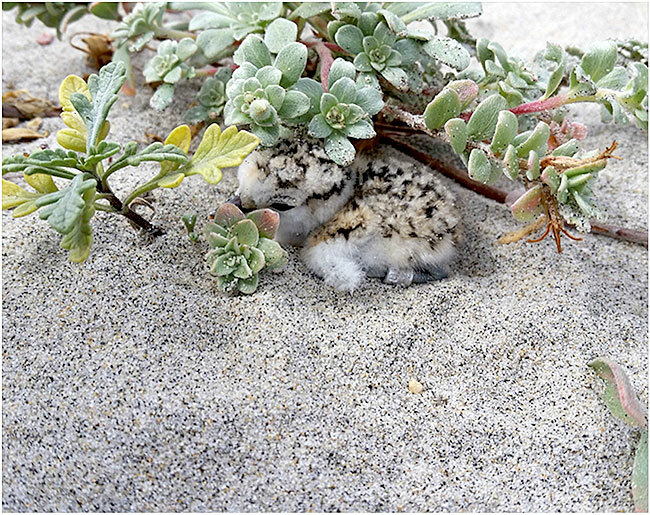 Western snowy plover chicks are severely threatened by proposed Monterey Bay Shores Resort in Sand City dunes. The Chapter retained environmentalist biologist Scott Cashen to submit comments (PDF of letter here) to the CCC regarding the revised Habitat Protection Plan (HPP) dated Nov. 11, 2015 prepared by the developer, Security National Guarantee (SNG) for Monterey Bay Shores Resort planned for 39 acres of beachfront dunes in Sand City. The Project calls for a 1.34 million foot mixed-use resort which entails approximately 680,000 cubic yards of grading, 20.37 acres of "habitat restoration," utility extensions and infrastructure, and related development (e.g., roads, parking lots, signs, and lights). The chief concern is the long-term presence of breeding western snowy plover (Charadrius nivosus nivosus) on this site. The revised HPP claims it contains measures for the protection, preservation, and recovery of the western snowy plover but we do not agree. The HPP says the proposed Project would not: (1) significantly impact plover habitat, (2) impair essential behavioral patterns (including breeding, feeding or sheltering), or (3) cause take or harm of any snowy plovers. Scott Cashen’s 69-page letter explains in what ways these claims and conclusions are unfounded and contradict existing evidence. Indeed, the revised HPP provides no evidence that a project similar to what SNG proposes has ever been built without having a significant impact on the western snowy plover. To the contrary, there is overwhelming scientific evidence that projects similar to what the SNG proposes have had numerous direct and indirect impacts on the species. The basis for Cashen’s detailed comments are concerns cited by the U.S. Fish and Wildlife Service ("USFWS") in a letter dated April 7, 2014 and submitted to the CCC regarding the Project impacts on the western snowy plover. A brief description of concerns still unresolved in the revised HPP are: 1. Inadequate or misrepresentations of plover breeding and nesting activities on the site, 2. The 11 "biological objectives" listed in the revised HPP provide only superficial benefits to the snowy plover, 3. Insufficient seasonal restrictions and other measures to ensure "nesting protection zones", 4. Lack of details for a predator prevention plan, 5. Inadequate discussion of success criterion for western snowy plover and 6. Negative impacts likely to occur in critical habitat from ongoing existence of the Project.